Variety is the spice of the Three Arctic Islands: Spitsbergen, Greenland, and Iceland adventure, named one of National Geographic Traveler’s 50 Tours of a Lifetime. Check three different Arctic regions off your list, heading above the Arctic Circle to Spitsbergen, in the Svalbard archipelago, to remote East Greenland and ending in Iceland. The towering cliffs, iconic wildlife, massive glaciers and swaths of untouched tundra of these three Arctic tours de force never cease to impress. Exploring Spitsbergen, the largest of the Norwegian-ruled Svalbard islands, rewards you with abundant wildlife and austere beauty. Here, you’ll visit spectacular glacier fronts and steep- walled fjords with walrus, polar bears and Spitsbergen reindeer among your possible wildlife sightings. Birders will be thrilled to see arctic terns, skuas, long-tailed ducks, kittiwakes and ivory gulls. When conditions are right, you could sail within 10 degrees of the North Pole! Your Arctic adventure begins in Oslo, where you may arrive at any time during Day 1 of your itinerary. Upon arriving in this splendid capital city, known for its green spaces and museums, you will check into your included airport hotel. Exploring Spitsbergen, the largest island of the Norwegian Svalbard archipelago, rewards you with abundant wildlife and austere beauty. Here, you’ll visit spectacular glacier fronts and steep-walled fjords, with walrus, polar bears and Svalbard reindeer amongst your possible wildlife sightings. Birders will be thrilled to see arctic terns, skuas, long-tailed ducks, kittiwakes and ivory gulls. If conditions allow, you could sail within 10 degrees of the North Pole! While sailing south through the Greenland Sea, your Expedition Team will teach you about the wildlife and history of Greenland, your next stop. On deck, you’ll learn to identify seabirds on the wing. Take in a lecture, share your photos, sip an icy cocktail in the bar or watch a movie—there are many things to do during your time at sea. During your tour of Greenland’s remote eastern coast, you’ll enjoy Zodiac cruises and shore visits to several locations. Explore the remains of ancient Thule settlements and keep an eye out for grazing muskoxen—40 percent of the world’s muskoxen population lives here. Finally, you will sail through spectacular Scoresbysund, the birthplace of many icebergs and, some say, the most beautiful fjord system in the world. 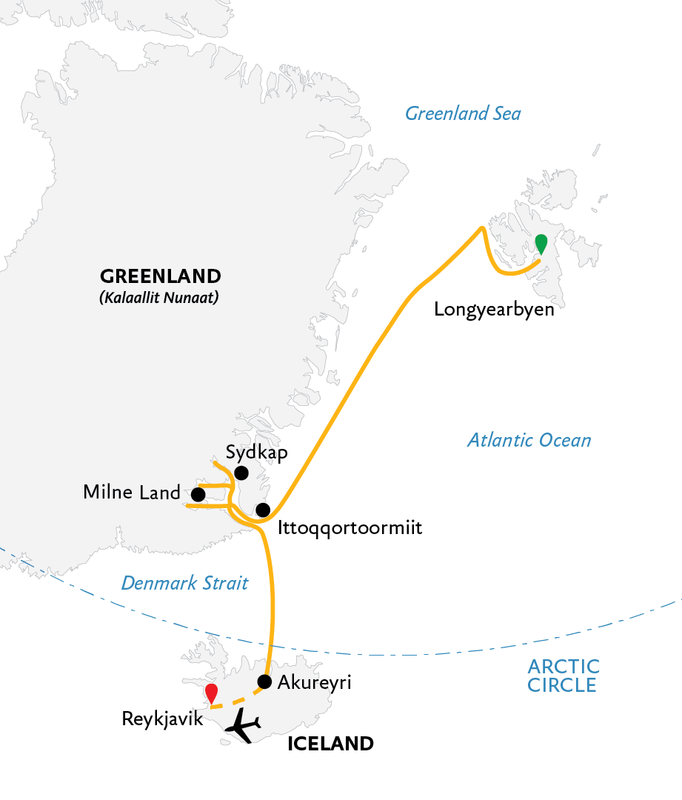 As we cruise south, the Denmark Strait is your pathway toward Iceland. Your Expedition Team will keep you informed and entertained with presentations about the history of exploration in the Arctic and the seabirds you’ll see soaring above your ship. While sailing north through the Denmark Strait, your Expedition Team will teach you about the wildlife and history of Greenland, your next stop. You’ll learn about the history of exploration in the Arctic, as well as polar politics, glaciology and climate science. You’ll also learn about the incredible sights, geology and ecology you will soon explore. During your tour of Greenland’s remote eastern coast, you’ll enjoy Zodiac cruises and shore visits to several locations. Explore the remains of ancient Thule settlements and keep an eye out for grazing muskoxen—40 percent of the world’s muskoxen population lives here. If conditions allow, you may also visit Ittoqqortoormiit, the most remote community in East Greenland. 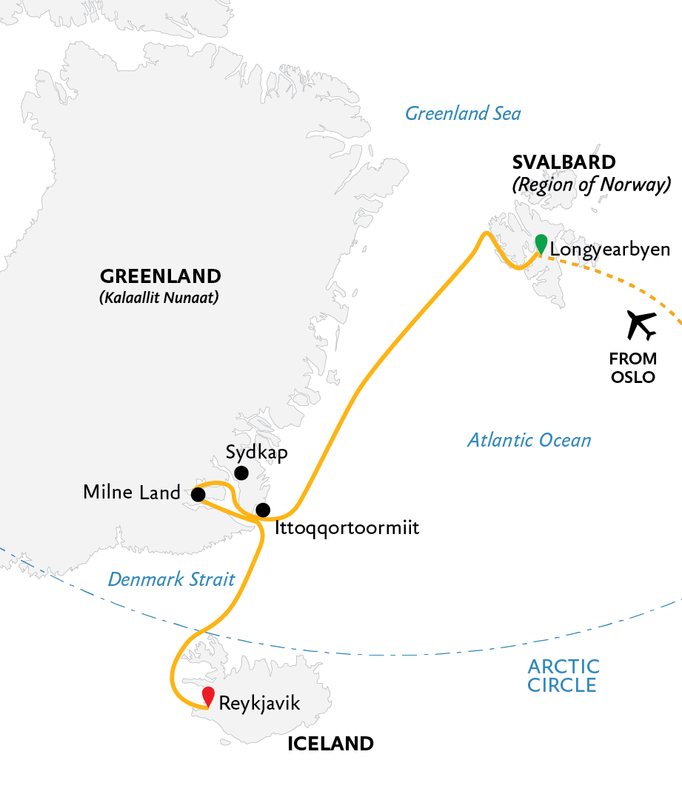 As we continue to cruise north, the Greenland Sea is your pathway toward Svalbard. 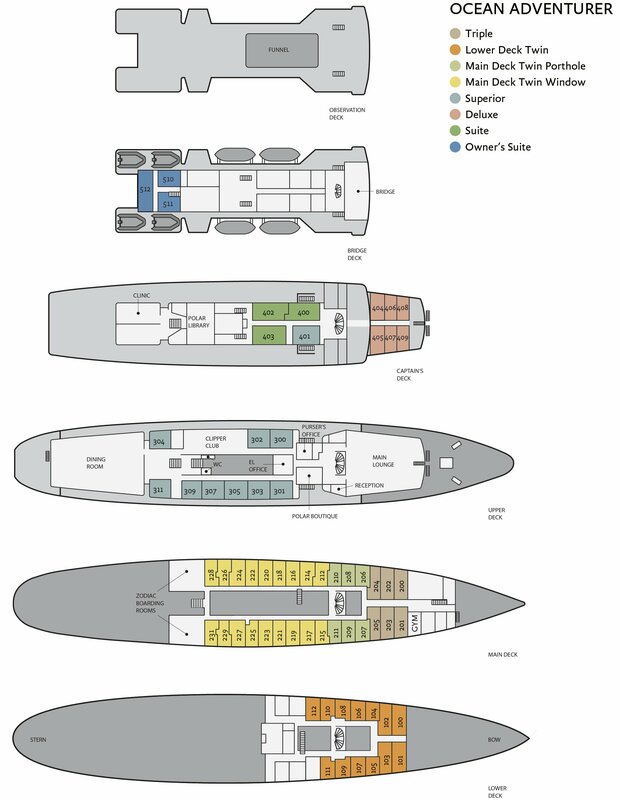 On deck, you’ll learn to identify seabirds “on the wing.” Take in a presentation, share your photos, sip an icy cocktail in the bar or watch a movie—there are many things to do during your time at sea. Exploring Spitsbergen, the largest island of the Norwegian Svalbard archipelago, rewards you with abundant wildlife and austere beauty. Here, you’ll visit spectacular glacier fronts and steep-walled fjords, with walrus, polar bears and Svalbard reindeer amongst your possible wildlife sightings. Birders will be thrilled to see arctic terns, skuas, long-tailed ducks, and kittiwakes. When conditions are right, you could sail within 10 degrees of the North Pole! The time to say goodbye has come. 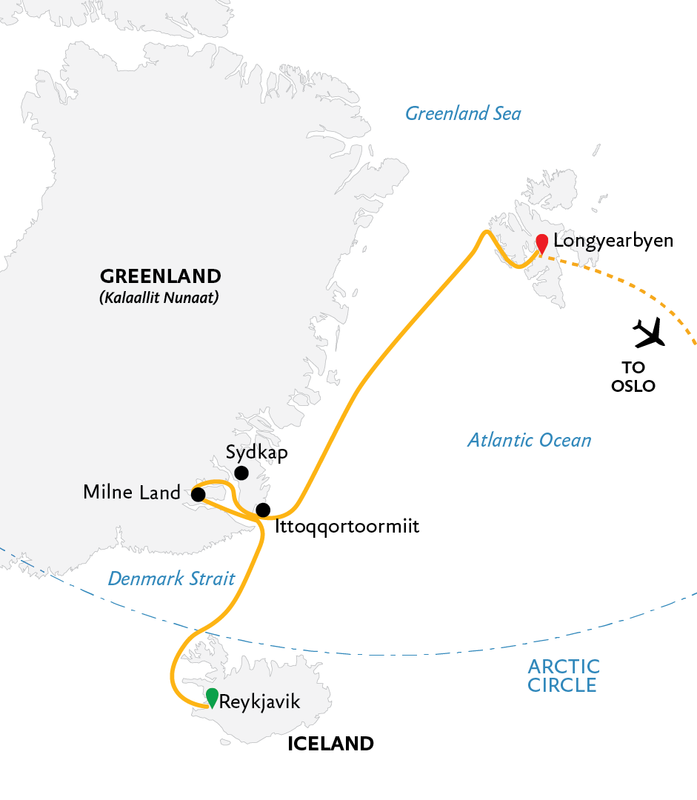 Your adventure ends in the frontier-style settlement of Longyearbyen. From here, we’ll transfer you to the airport for your return group charter flight to Oslo.